A football pundit has been banned from driving for 20 months after being found guilty of drink-driving in Suffolk. 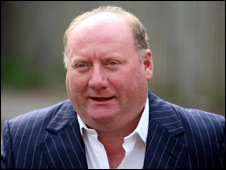 Ex-international player Alan Brazil, who works for TV and radio stations, was also fined £750 with £450 costs at Sudbury Magistrates Court. He was in his BMW car on 16 September 2007 when police saw him "weaving". Brazil, 48, from Hadleigh, Suffolk, was found to be twice the drink-drive limit but argued in court that police did not have proper cause to stop him. The court was shown DVD footage of Brazil struggling to give police a breath test sample and discussing with a policeman the "distinct lack" of officers in the Suffolk force. Pc Simon Hughes suggested to Brazil the staffing situation in Suffolk was "crazy", magistrates heard. In the footage filmed in September last year, Mr Brazil is heard complaining about the length of time the tests were taking. Mr Brazil, who played for Ipswich Town, Manchester United and Scotland, was heard to express disbelief that he was over the alcohol limit for driving although he admitted to drinking a bottle of wine.